One of the best things about teaching technical classes around the country is getting to meet people from all kinds of different industries. Sometimes, like a couple of weeks ago in Raleigh, NC a class will have people from several different types of industry. In that case the challenge can be using examples that everyone will relate to. In other cases, like last week in Oklahoma City, everyone is from the same industry and I need to learn more about their field ahead of time to keep things relevant. Even when I study a field ahead of time there are often words, acronyms and slang that I have never heard before. Last week’s class was attended by technicians from the liquid natural gas transport industry. While I have been exposed to some other petroleum-related industries before and also have done some projects and teaching in process control fields, much of the language and terms were new to me. Rather than trying to guess what things might mean and pick it up as I go along, I usually interview the people in the class ahead of time to try and learn at least some of the language. Even then, words that mean one thing in one industry may mean something completely different in another. This is especially true with acronyms: for some reason they are almost always three letters, which can make for a lot of overlap. I remember a TV commercial that used to say “We must stop DVT” (Deep Vein Thrombosis I think…) it was only a few years later that Cognex bought DVT, my old favorite vision system platform. Soon after, they discontinued their cameras and shut the remnants of the company down. That will cure them! I still see commercials asking people to send money to ACS (American Cancer Society), but never received anything at my old company, Automation Consulting Services. Darn. I still never figured out what was so funny about DCP sending a mixture of WTI and Hoops when they were supposed to be running Canadian Crude, but I did find out a lot more about the liquid natural gas industry, at least the transport side. For instance, about 80% of it moves through Cushman, Oklahoma. It has to be kept above 300 PSI or it turns into vapor, so most of it moves down the pipelines at 500+ PSI using VFDs (Variable Frequency Drives :-)) and 1500-5000 HP motors at 4160VAC. This is pretty big stuff compared to the “things” side of the manufacturing world. Valves are likewise huge and expensive. Technicians also drive up and down the highways servicing all of these big pumps, most of them controlled by Siemens PLCs and a central SCADA system. They need to be adept at mechanical, electrical and software since they are often on their own. Other companies employ technicians that are constantly checking the pipelines themselves for flaws and cracks, keeping them on the road for weeks at a time. And this is just a small part of the multi-billion dollar petroleum industry right here in this country. In my Raleigh class I had a guy responsible for “kill plants”. At first I thought he was pronouncing it “Kiln” and that it was related to ceramics or something. After a while it came to light that these plants were where hog processing took place, and indeed was where they were killed. It turned out to be more humane than I had heard, but there were still terms used like “Hog Splitter”, “Back Saw” and “Eviscerator”. All of these sounded quite descriptive of what the devices did. I still haven’t given up pork chops though. One of the points I have made to the students in my classes is that programming needs to be done with the end user or customer in mind. Who is the customer? It might even be someone in your own company that has to work with your software. As such, it is important to use the language of the industry. Sometimes you won’t find the words and acronyms in any published or online resources, in which case you need to talk to the users. For a PLC program, this may be a technician, whereas for an HMI or SCADA screen it may be a machine/system operator or engineer. It may even be necessary to document in another language. 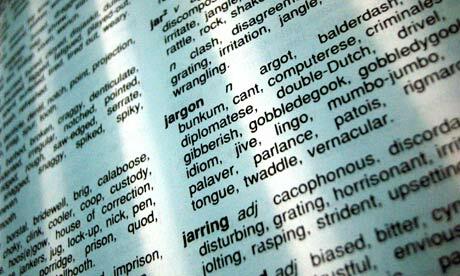 Regardless of how an outsider to an industry may feel about the jargon or slang used, it is often necessary to describe things in the way that benefits the user or reader. What kind of jargon do you use in your industry?